Info: Unusual native Texas sunflower with soft downy silver colored leaves. Blooms in the fall. Give this annual plenty of room and full sun. With adequate moisture and rich soil this sunflower can grow quite large. Pinching back early helps keep the plant smaller and bushier. 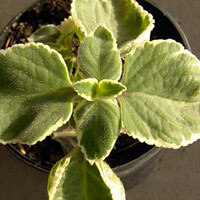 This is a draught tolerant sunflower and with less water its leaves are softer and more velvet like. 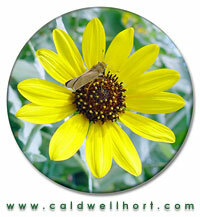 Masses of yellow flowers in the fall soon make seeds that attract finches and other seed eating birds. Info: Rare, endangered species from the Mascarene islands of Mauritius and Reunion Isles. Blooms red to orange flowers, leaves are edible and used as a spinach substitute, flowers are used to make a purple dye. Interesting is the foliage which starts out looking like a bird's foot, but with age its leaves get larger and take on the appearance of the typical rosa-sinensis species. Beautiful and unusual variety! Info: Rare endangered species. Full sun, moisture preferred. Blooms beautiful white flowers with dark throat. East Texas native, attracts butterflies, foliage is very frilly and fine, resembles cannibus. 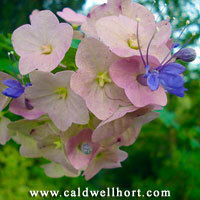 This is the first time I've offered this plant for sale, although we have grown it for several years in the gardens. Info: Grows to 10 feet tall with 5 inch wide pink flowers with cranberry centers. Prolific bloomer, hard to find. Info: Rare! Unique flowers are the main interest of this scrambling shrub. Flowers backed by a broad, circular calyx, appear in dense terminal clusters throughout the summer and fall seasons. Growth is almost vine like and regular pruning helps keep a more bushy appearance. Grow in full sun to partial shade. Comments: Native to South Africa, Pink Chinaman's Hat really has blue flowers. The pink part is the persistent calyx surrounding the original flower. It lasts long after the original flower falls. 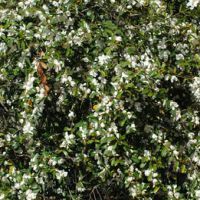 The plant is an easy to grow small shrub to 7 or 8 feet tall. Prolific flowers are attractive to butterflies. Comments: Neat variety, hard to find. Blooms all the time and is easy to grow. Bush type habit (most Hoyas are vining). Beautiful wax star flowers. Excellent houseplant. 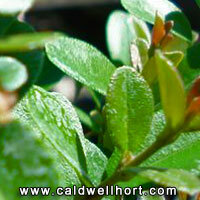 Comments: Okinawa Holly is a compact evergreen shrub growing to 4 feet tall and wide. Leaves are glossy and tiny. Flowers are white followed by bright red berries in fall and winter. 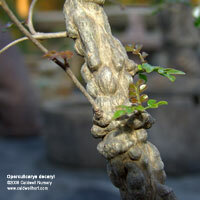 Often used as a bonsai plant. Also makes a good hedge, container plant, or specimen plant. The plant requires constant moisture and a rich well drained soil. Prefers full sun for dense compact shape. Protect from frost and freezing. A relative of the Brugmansias, Iochromas are a soft-stemmed, brittle-wooded, well-branched shrub reaching that reaches about 5’ in height. Inflorescences are auxiliary umbels on new wood, 5 to 20 flowered. The flowers are tubular, several inches long, and very showy. Native to Ecuador at 3200-7000 feet, they are surprisingly adapted to sea level culture here on the Gulf Coast. Do protect from frost and freezing temps. Iochromas are not common in collections. We also offer limited quantities of Wine and Scarlet colors. Magenta flowered Morning Glory. 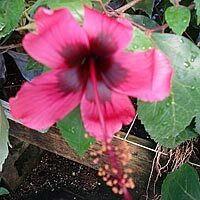 Tropical perennial vine with clusters of striking maroon red blooms and glossy palmate foliage. Hummingbirds love it! Unique and hard to find. Info: Small pot bellied shrub native to Central America has deeply lobed large leaves and clusters of bright scarlet-orange flowers during summer months. Prefers bright sunny dry and hot conditions. Looses leaves in winter but flowers often remain. Does well as a potted specimen plant. Attractive to butterflies. Comments: Huge colorful tricolor 'cabbage head' shaped Kalanchoes will make a stunning addition to your succulent collection or colorful holiday plant gift this holiday season. 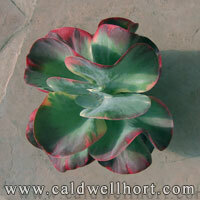 Flapjack Kalanchoe grows best in light shade. Keep on the dry side in winter. Best color develops when grown in nearly full sunlight. Info: Medium size tropical tree with large crinkled pink to purple flowers, needs a well drained soil and moderate water. Deciduous in winter. Leaves turn bright red before falling. Flowers are much larger than our regular Crepe Myrtle Lagerstroemia indica and they are exceptionally showy. Info: Bush Mallow is a small evergreen hardy shrub 5 to 6 feet tall with gray-green leaves and prolific 2½ inch diameter lavender and purple flowers. 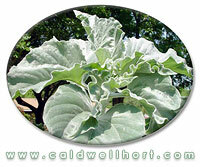 Prefers full sun to partial shade, is drought tolerant and has few pests. Bloom period last from early summer until late fall. 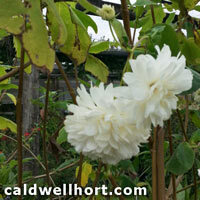 This hardy mallow is a garden variety with parents native to the Mediterranean. It is relatively unknown and underused along the Gulf Coast and surely deserves more attention. 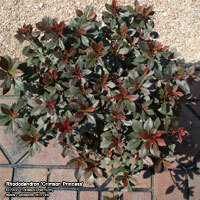 Comments: Henna plants enjoy hot dry weather and full sun for best growth. Their flowers are among the most fragrant of all plants. Shrubs can be grown as potted plants and may reach 6 to 8 feet after several years. 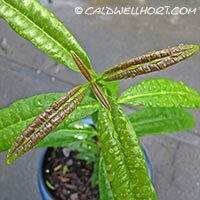 Protect Henna plants from cold weather below 50. In the West Indies and Mexico Henna is known as "mignonette." Henna produces a red-orange dye molecule, lawsone. This molecule has an affinity for bonding with protein, and thus has been used to dye skin, hair, fingernails, leather, silk and wool since ancient times. Pure natural Henna seems to have no negative health effects. Info: A tough drought tolerant plant slowly growing to about 5 feet tall with silver white leaves and white flowers in humid summer weather. 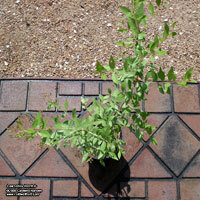 Texas Sage likes well drained relatively dry soil and full sun to bloom best. Little fertilizer or watering is needed and it makes a good low maintenance plant for hedges, full sun potted patio plants, and foundation plantings. 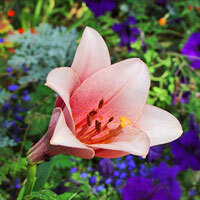 Info: Beautiful pink delicately scented lily blooms late spring with muted pink blooms. Grows 3 feet tall and multiplies over time. 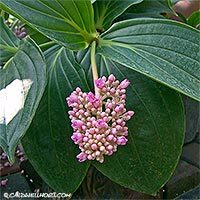 Large flowers, easy to grow, and makes an outstanding feature for a large patio container and are great as taller plants in a border garden. 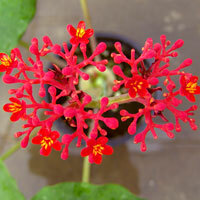 Info: Lots of bright double red 1½ inch blooms atop a low rosette of fuzzy silver leaves, great for cut flowers. Blooms resemble miniature carnations, contrasting beautifully with silvery, wooly foliage on erect stems. Good drainage is essential for successful over wintering. Info: Semi-evergreen perennial groundcover with small foliage forming an attractive carpet of chocolate hewed foliage blooming with lush yellow flowers in late spring. 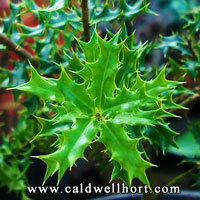 Info: Beautiful holly like foliage, year	round screen and windbreak, rounded crown like Live oak. 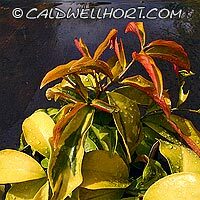 The evergreen leaves emerge bright red in spring, shading to copper before turning glossy dark green. By summer, leaves reach 6in. long. Deep purple fruit in fall are followed by chartreuse star shaped flowers. Connoisseur tree, rarely available. 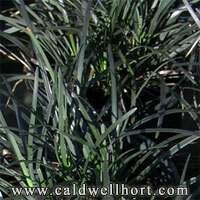 Info: Rare cultivar developed by Yucca Do with dark brown chocolate spots and ultra wavy leaf edges. Overall height is only 4 inches tall with leaves about one foot long. Flower spikes can grow to 4 or 5 feet tall ! Grows best in full sun. A giant Manfreda grows 12 inches high and 36 inches wide. 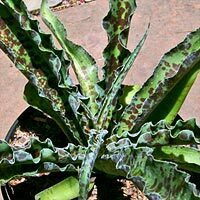 Huge succulent leaves washed in lavender with a peppering of chocolate-brown spots. 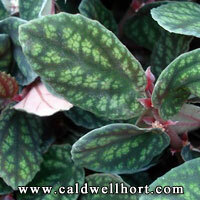 Plant pictured is from our current selection for sale. 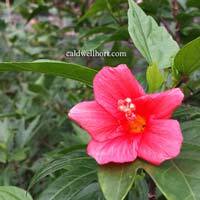 A small tropical shrub with bold leaf variegation and bright pink leaf stems. 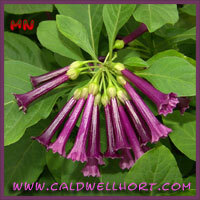 Grows to about 4 to 6 feet tall and makes a striking potted patio plant or accent in the garden. Must be protected in freezing weather, otherwise easy to grow. 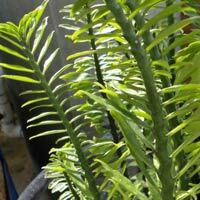 Likes full sun or light shade, regular watering, and monthly fertilizing. 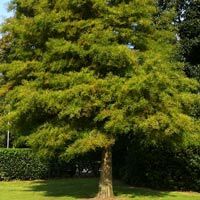 From South America, this is a small tropical tree that is hardy along the Gulf Coast. 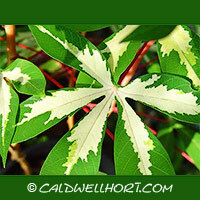 Grows to about 15 feet tall with beautiful palmate leaves reminiscent of a Schefflera leaf. 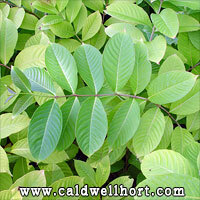 Fast growing, makes a wonderful shade tree for patio or garden. Deciduous in winter. 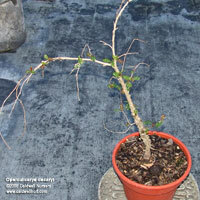 Prune back branches in winter to keep shape compact the following year. One of the most spectacular flowering houseplants available! 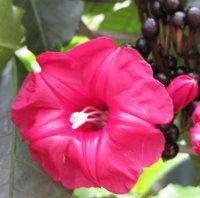 Eighteen inch long clusters of bright pink flowers hang down from stems of lush tropical leafs. 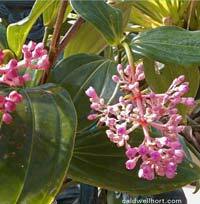 Medinilla likes bright shade, high humidity, and warm temperatures. 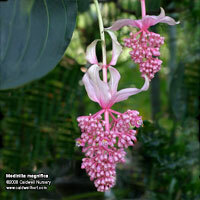 Medinilla is a high altitude rain forest plant from the Philippines. 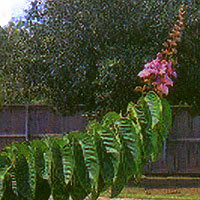 In its native habitat, it is an erect shrub to 6 feet tall. It likes bright light and excellent drainage. Minimum night temperatures should be above 65 degrees. Flowering during most of our warm season, Medinilla is an excellent tropical specimen for greenhouse and potted plant culture. Info: Even more beautiful than M. myriantha. Clusters of bright pink flowers with large pink bracts at base of flower stems. Medinillas are epiphytes, often growing in trees. 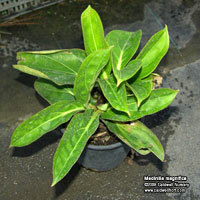 Provide a very well drained soil mix and do not expose M. magnifica to temperatures below 50. Does well by a bright interior window in winter. 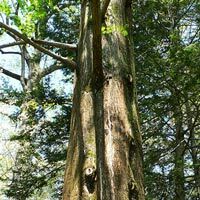 Very Rare conifer that grows to 200 feet. Likes plenty of water. Rare to find, cold hardy to 20 degrees. 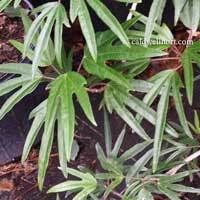 This native of Hawaii makes an evergreen shrub with silver fuzzy leaves. Has beautiful orange bottlebrush flowers in fall. Prefers good sun and good drainage. Outstanding plant! Can reach 5 to 6 feet. A personal favorite! Arguably one of the finest fragrances of any flower. 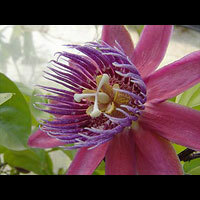 Joy Perfume is derived from the essential oils of this lovely flower. Does well in a large container, must be protected in freezing weather. Blooms throughout the year. 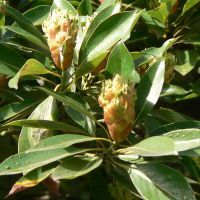 Hardy evergreen screening shrub or small tree from southern China, rare to find! grows 8 to 10 ft, 5ft. wide. 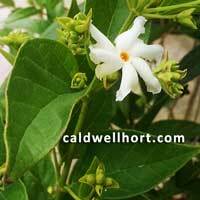 upright grower, dense habit, sweetly scented porcelain like flowers in mid spring, blooms April to June. Related to Magnolias. Native to S.E. 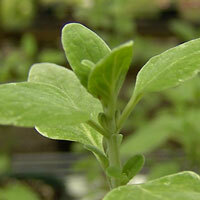 Europe and Western Asia, very aromatic with a fresh invigorating minty-marjoram flavor and aroma. Leaves boiled in water make a medicinal tea. Delicious as a burst of flavor in salads or on toasted bread with olive oil. Small bluish-white flowers throughout the growing season. Does well in containers or in the garden. Provide full sun and good drainage. Interesting, handsome foliage. Blooms beautiful white daisy flowers in spring and late fall. 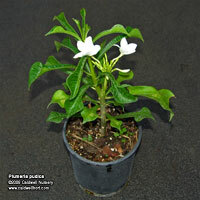 Winter hardy, easy to grow, rare to find. Grows to 6' full sun. Info: Compact 2 foot tall Dwarf Cavendish type banana with red blotching on leaves. 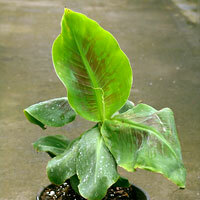 This rare new banana introduction stays small and makes a great ground cover or potted plant. Keep it well watered and grow in full to partial sun. Fertilize regularly. Small bananas are edible. Info: fragrant, will bloom all year sunny warm tropical conditions. 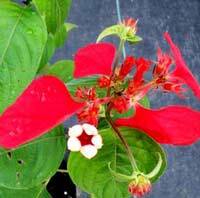 Info: red poinsettia like bracts surround small white flowers that are fragrant. Will bloom all year, sunny warm tropical conditions. Sensitive to cold. 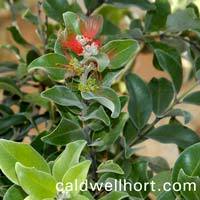 Info: Florida native evergreen shrub grows 2 to 3 feet tall, is drought tolerant. fragrant and attracts many species of birds. Leaves fragrant like Eucalyptus, flowers fragrant, white and blooming most of the growing season. Bark reddish brown and smooth. Keep soil moist. Info: A Yucca-Do discovery from Argentina, this native heat tolerant Nierembergia will bloom all summer with profuse light lavender flowers. Grows to about 10 inches tall and 18 inches wide. Info: Rare large shrub. Fragrant night bloomer sometimes called Coral jasmine. White flowers with an orange eye. All parts are used medicinally. Cold hardy to low 20s. 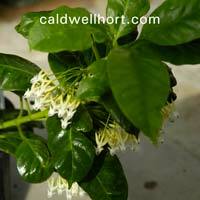 Cestrum nocturnum is the common night blooming jasmine. Info: Rare to find, tropical large shrub or small tree. Attractive leathery leaves. Plumeria relative. Very salt tolerant. Fragrant white flowers are followed by red fruit that resemble elongated tomatoes. Fruit is not edible. These fruits are the "sea beans" that wash up on the coast. Info: A small deciduous tropical tree from Southwestern Madagascar suitable for container growing as a bonsai. Grow in full sun to light shade. Tiny flowers are usually red. Trunk bark is rough and picturesque even on small plants. Protect from any frost. Comments: Black Mondo Grass is an evergreen perennial that makes a great groundcover. Fresh foot long narrow leaves start out green but quickly turn black black black. Plants spread by underground stolons with thick fleshy roots. Flowering is in the fall with fragrant purple-pink flowers followed by shiny black berries. Wonderful conversation plant and a great background for colorful accent plants. Comments: Perennial from the Andes. Root crop in the yam family, very high nutrients. This plant is easy to grow and produces potato like tubers that are crunchy and tangy with a hint of nutty taste. It is very high in phosphorus and iron, pottasium and protein. High in amino acids. Can be bolied, baked, fried or added to soups and stew. Very rare to find! Tubers form in autumn. Dig after first frost. 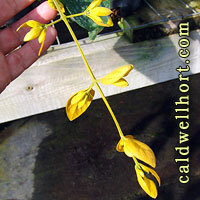 Comments: Beautiful fall blooming vine from South America with flowers up to 5 inches in diameter. Grow in full sun, average watering. Comments: Rare tropical - 4 feet. Blooms constantly, easy to grow. Rarely offered, beautiful pot plant. Comments: Very rare variety of Redbird Cactus. Tropical succulent shrub with zigzag stems. 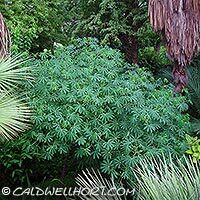 Native to dry tropical forest in Florida and Mexico. Blooms unique red slipper-like flowers that resemble tiny redbirds. 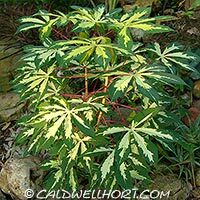 Other common names include Christmas Candle, Devil's Backbone, Fiddle Flower, Jacob's Ladder, Japanese Poinsettia, Jew's Slipper, Jewbush, Milk-Hedge, Myrtle-Leaved Spurge, Padus-Leaved Clipper Plant, Red Slipper Spurge, Redbird Flower, Slipper Flower, Slipper Plant, Slipper Spurge, and Zig-Zag Plant. 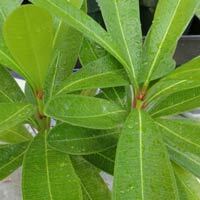 Comments: As a trailing indoor plant for basket or terrariums, Satin Pellionia excels. 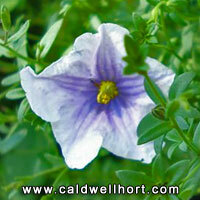 It has showy leaves with dark veins on an olive-green background and purple undersides. 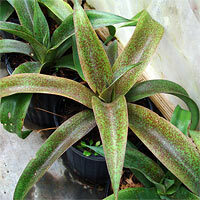 Pellionia likes humidity and warmth, bright indirect light and moist but not wet soil. 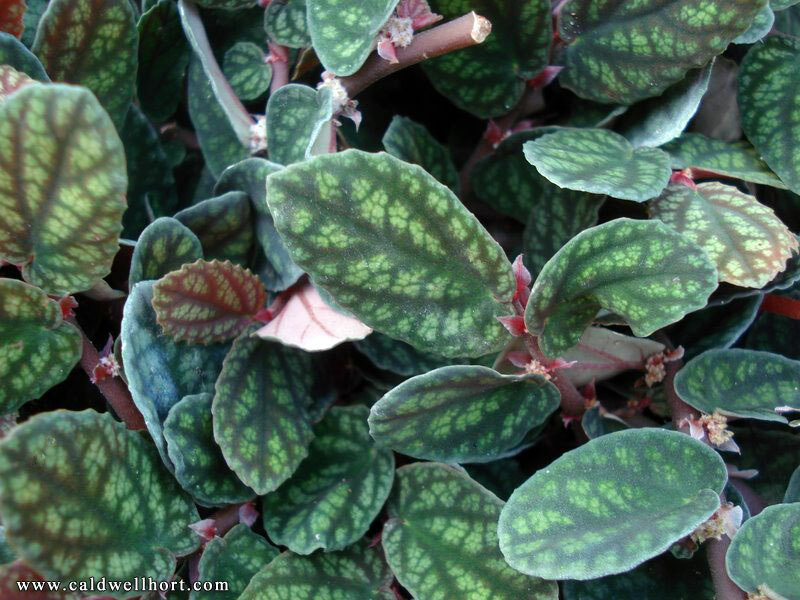 It is an easy to grow plant often used as a ground cover in tropical climates. Protect from frost and freezing. Keep dry in winter. An unusual cactus with leaves! 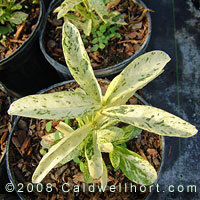 And variegated ones at that. 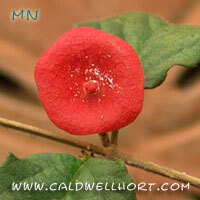 This small shrubby cactus originates in Brazil. It has beautiful pink wild rose like flowers and large thorns on the mature plants. Info: This small tropical vine native to Thailand flowers from spring until fall with many one to two ft clusters of yellow flowers. Easy to cultivate, unusual and much sought after tropical makes an excellent container plant for patio or bright window area. Minimum temperature should be kept above 50 degrees. 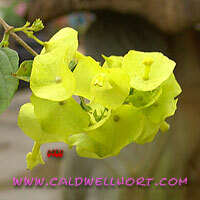 Sandpaper Vine can grow to 40 feet tall or be trained into a small shrub. Flowers in clusters up to 1 foot long, the flowers are dark blue and last a few days, but the blue calices last for weeks. 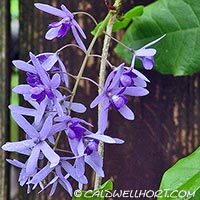 This vine likes plenty of mulch and an acid fertilizer if your soil is alkaline. Blooms heavily in late spring and sporadically throughout the growing season. Give direct sun or bright filtered light, medium to high humidity. Native to Mexico and Central America. 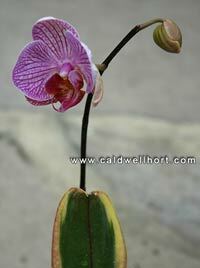 Bright edged variegated moth orchid. Leaves have bold creamy white border and are flushed with rose pink. Pink flowers in spring and late winter. Very rare to find! 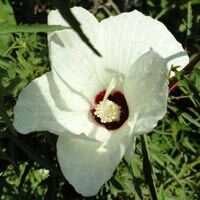 Hibiscus family - grows like "Confederate Rose" Hibiscus. Full bushy habit 8'. Blooms October through June, beautiful burgundy cupped blooms. Cold hardy, easy to grow! Rare to find! 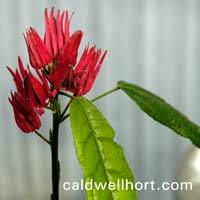 Allspice is a small tropical tree native to Jamaica in the Caribbean Islands. The dried immature fruit is ground to make allspice used to flavor meats, vegetables and desserts. Crushed leaves and berries smell like a mix of cinnamon, cloves, and nutmeg. Full sun, well drained soil, protect from freezing. 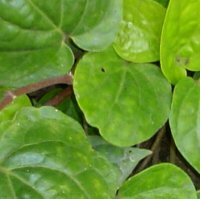 Betel leaf or ""Paan" is an evergreen climbing vine used in Indian culture. The leaves are eaten for digestion, also leaves are used to wrap vegetables in and cooked. Interesting and very rare to find! Large waffled leaves make nice ground cover. Produces white spath like blooms with black seeds. Seeds are ground and are the real black pepper of commerce. 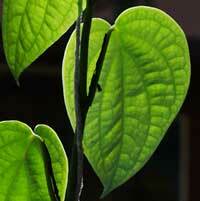 Easy - this plant has survived 18 degrees only to return twice as thick. Much sought after! Info: Succulent herb giving off the aroma of Vick's Vap-O-Rub or mentholatum when crushed. Performs well as a potted plant. Great conversation piece for the patio garden. Water then let dry out between next watering. Info: A Plumeria species with unusual fiddle shaped leaves blooming 9 to 10 months during the year with clusters of pure white long lasting flowers up to 3 inches in diameter and leaves that are nearly evergreen. Can take temperatures in the mid-thirties with no problem. Grows to 15 feet tall but can be pruned to be smaller. Info: Beautiful native wildflower, blooms May - September and makes an excellent cut flower. 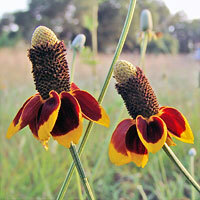 Flower resembles a colorful Mexican sombrero, hence the name, Mexican Hat. 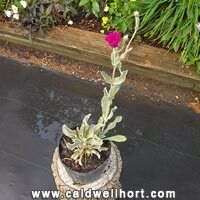 Two to three foot tall plants prefer full sun and a well drained soil. 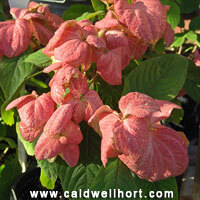 Info: 24 - 36" H, 18 - 24" W, Open medium height stalks of large flared tubular hot pink flowers in late spring to summer. Leaves are large, lobed, and slightly hairy with maroon spotting. 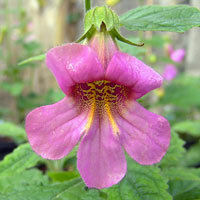 Best in a sheltered spot with full sun and evenly moist soil. Info: A dwarf Azalea with red foliage grows 15 to 18 inches tall. New variety has the darkest foliage of all the Crimson Series. 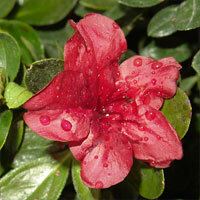 Info: An evergreen mounding Kurume Azalea 3-4 feet tall and wide, grows best in partial shade. 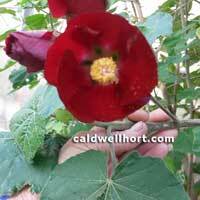 Hardy to -10 degrees F. and has deep red flowers. It's an early flowering Azalea. turn right on Band Rd, we are on the right, one mile. No dogs allowed at the nursery! Absolutely no professional photography pictures allowed at the nursery. Information on our herbs and medicinal plants are strictly for educational purposes and is not intended or implied to be a substitue for professional medical advice. Pleasee check with your physician before using any medicinal plant.